Join us for Episode 6! Sorry for the delay in posting, vacationing in the woods without good internet got in the way for a week. We should be back on our regular 2 week posting intervals soon! Thanks for waiting and we hope you enjoy the episode! Julia: Debuted her Spatterdash Wristwarmers for the Ravelry group Nerdy Swaps. She also showed her finished two-ply silk blend yarn and the beginnings of a seed-stitch jacket and shawl collared sweater. 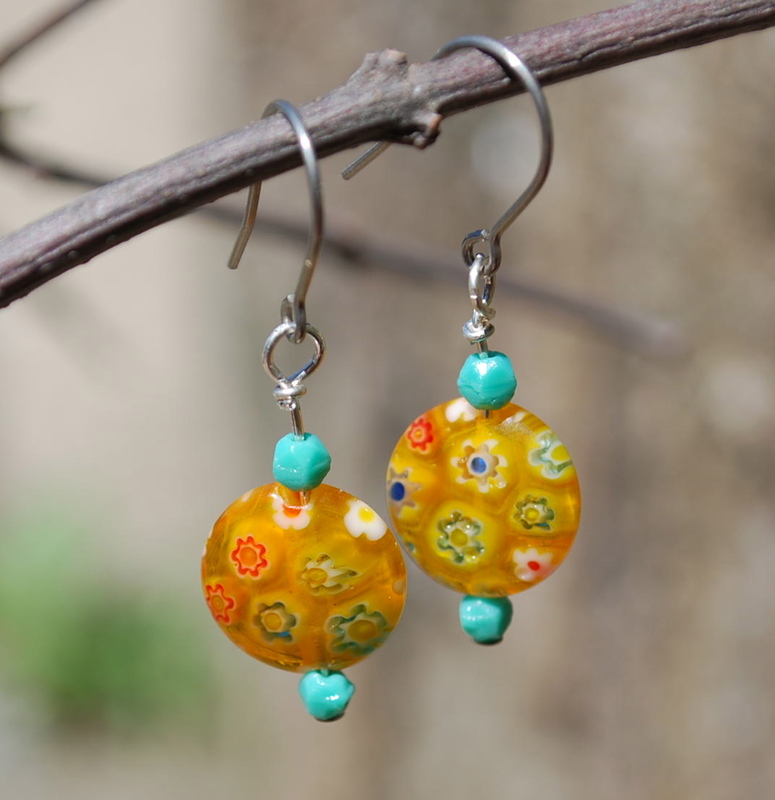 Sue: Showed us some millefiori earrings she mad which are on sale at her etsy shop. Thanks to Tina of the Knitting Blooms podcast for a beautiful skein of yarn! Julia and Sue showed the tools and materials needed to needle felt and demonstrated 2D and 3D projects. Julia: Showed off some spinning- a silk blend single. Also showed work on a pair of Hat Heel socks and demonstrated the Embellish Knit. Sue: Created a clay mushroom jewelry holder and showed off stash acquisitions. Julia showed techniques to fix problems beginners might find including twisted stitches, dropped stitches, unwanted increases (at the end of rows and by yarnover), picking up ladders, and figuring out knitting direction. Sue demonstrates for us. Stitch markers were won by Arletha and Linda through the Ravelry group. Congratulations! Please contact Julia with your address. Thanks to Josephine for my first Ravelry purchase of the Flip Toppers Children’s Mitts and to Morgen for sharing her stash! What nice surprises! Please continue to visit us and leave comments/iTunes ratings. We love to hear from you!